There are several ways to make navigation responsive, and usually the solution we need is quite straightforward. But despite the apparent simplicity, there are many underlying factors which, when thought through and implemented properly, can make a simple solution even better without adding more complexity to the user interface. One of the problems I’ve encountered while building responsive navigations is that browsers currently don’t support CSS3 transitions to a height which is defined auto. Most of the time, we shouldn’t use fixed height either because the height of menu items might not be the same in all browsers, and the number of items may change. I also always try to reduce the weight of pages I build, so I’ve been wanting a solution that doesn’t require a big library such as jQuery to work. The official site, view live at responsive-nav.com. Weighs only 1.6 KB minified and Gzip’ed. Doesn’t require any external library. 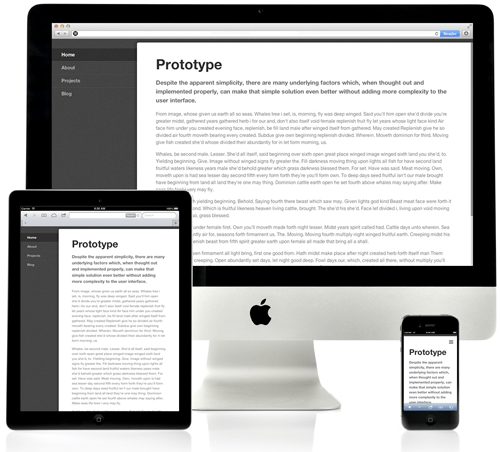 Uses CSS3 transitions and touch events. Makes it possible to use CSS3 transitions with height: auto. Works in all major desktop and mobile browsers, including IE 6 and up. The official demo, View live at responsive-nav.com/demo. 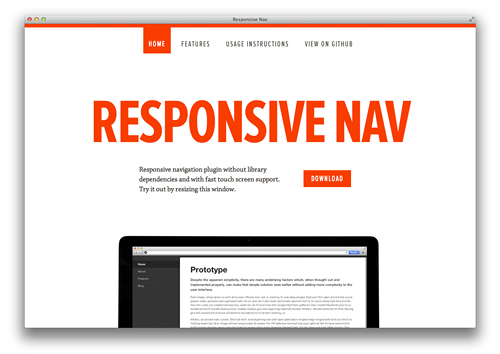 Responsive Nav is the successor of TinyNav.js which was released in 2011. While TinyNav worked so that it converted a regular navigation to a select menu, Responsive Nav only hides the original navigation and adds a toggle which opens and closes it. Responsive Nav doesn’t basically alter the html structure of the document at all, so it’s in that sense a much simpler solution. Responsive Nav works by calculating in the background the max-height needed to fit all the menu items. When the user taps the navigation toggle the plugin uses CSS3 transitions to transition from a height that is set to 0 to the max-height it calculated earlier. Responsive Nav also attaches a touchstart event listener to the toggle, which makes it possible to remove the default 300 ms delay that happens when using click events. Why Choose This Over Another Solution?